The Triumph Commander is a cruiser with Worcestershire sauce. Long design and low, many chrome, classic look and a huge engine V2 usually the ingredients to make a cruiser. But to create the Thunderbird Commander Triumph added a good dose of Worcestershire sauce to the classic recipe. Instead of two cylinders arranged in "V", as fitted all bikes Harley-Davidson, the Hinckley factory has adopted a parallel dual cylinder large cubic capacity to try to win over fans of custom segment. Besides the "engine" of 1,699 cm³, Triumph caprichou in classical style and impressive look. 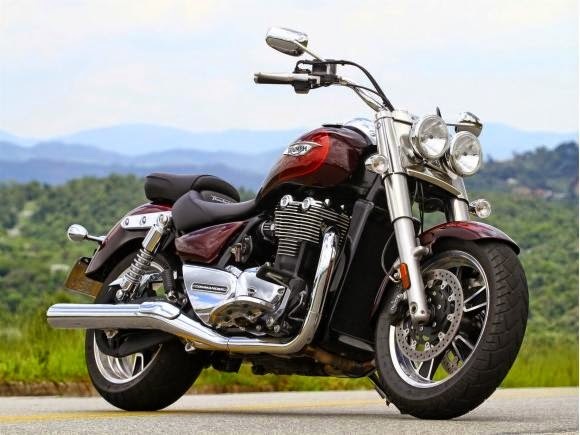 Thunderbird design is marked by a large tank with a capacity of 22 liters, a wide handlebar, two large chrome exhaust tips and an optical assembly formed by two powerful headlights. The excellent workmanship is another noteworthy aspect: gleaming chrome, high quality painting, and attention to detail, as well organized spinning the handlebars and engine covers with the name of the bike. Okay to consumer tastes bikes "American". Imported from England, unlike other Triumph models assembled here, the Commander also carries a nice price tag: US $ 16,000. When mounting the Commander the first thing that comes to mind is, "as this bike is great." After all, are 348 kg of steel in running order spread over 2.4 meters long. But the bank only 70 cm from the ground and the handlebars - popularly called the format "bull horn" - start to feel good control of the bike. As in all Triumph, you need to press the clutch lever to start the parallel cylinder DOHC, of ​​1,699 cc capacity with liquid cooling, waking up quickly and emits a rhythmic, characteristic sound of this engine architecture. With an amazingly light clutch, hitch first gear easily without many leaps or noises. The drive has plenty of torque: the maximum torque of 15.4 kgf.m is now available to 3,550 rpm. In conjunction with the exchange of soft couplings, soon enough the sixth and final march, running with low vibration and very "strength" for overtaking. The maximum power of 93.8 hp at 5,400 rpm appears - but forget the rotations, the great panel of the Commander, located on the tank, does not bring tachometer. Only a large speedometer and a fuel gauge, both analog, with a small digital screen that has clock, autonomy and two partial odometers. The performance is sufficient to maintain a good cruising speed without much effort and vibration. Qualities for anyone thinking of traveling. 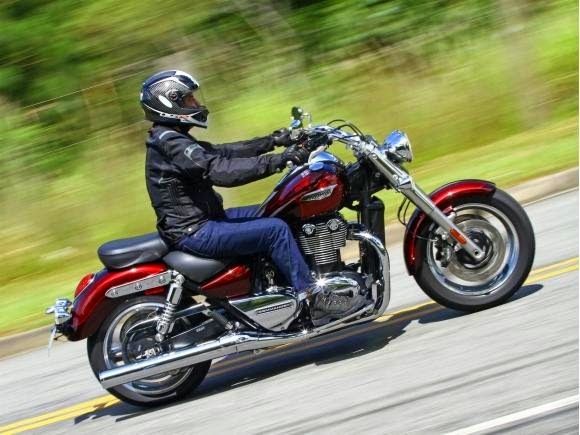 The Triumph insists that the Commander is not simply an American cruiser made by an English factory. The brand says that the model bears striking qualities of other motorcycle Hinckley, such as good maneuverability. After riding the Commander in traffic and on the roads, we have to agree. Mounted on a tubular steel frame with two parallel cylinder engine forming part of the structure, Commander has a good weight distribution. Maneuver it even at low speeds is hardly an easy task, but it is much simpler than you think. The suspension assembly brings Showa conventional telescopic fork with 47 mm diameter pipes and 120 mm of travel; on the back, balance with two shock absorbers with adjustment in spring preload and course of 108.5 mm. Well agreed to rider comfort, the suspensions also do a good job to absorb the floor imperfections: corrugated asphalt and even some bumps did not all reach the "limit". A differential between other models in the same segment. Help in this task of absorbing high impact and wide tires Metzeler the measures 140/75 at the front; and 200/50 at the rear. Both mounted on light alloy wheels of 17 inches. And the tasty Worcestershire sauce also appears in the resourcefulness of the Commander on winding roads. It is hardly a sport, of course. But it is possible to attack curves with good speed and a lot of confidence. 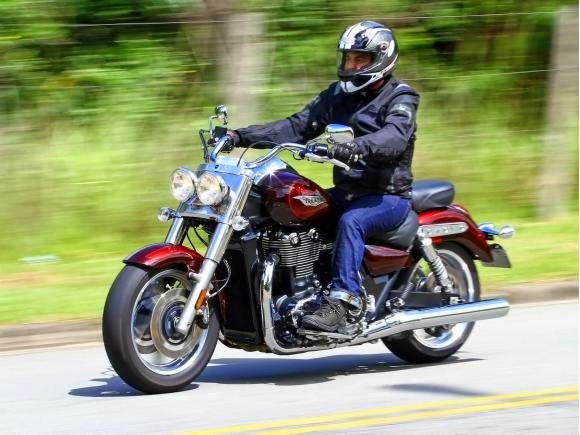 Although the pedals scrape the ground with relative ease, do not worry: the Triumph predicted this and adopted plates under the platforms that can be replaced. To make good cycling the Commander, are the brakes. Floating dual front discs 310 mm in diameter bitten by Nissin four-piston calipers and single rear disc of the same size, but with Brembo caliper dual piston. The ABS is standard and operates on two wheels. It has been shown effective to stop this "big" bike and the antilock system worked well on those rainy summer days. Besides the good cycling and smooth powertrain and transmission, the Commander is extremely comfortable. The bank has a generous foam and a useful lumbar support for the driver, the curved handlebars back leaves the arms and torso in a natural position and pedals provide the necessary support for the feet. 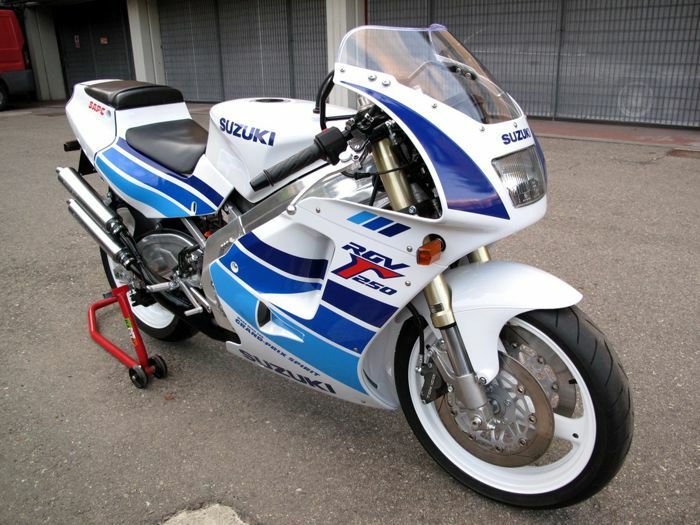 Anyway, that kind of bike to run many, many miles all day. And 22-gallon tank will help you in this task, after all with an average consumption of 19.9 km / l, it would be possible to run more than 400 km without refueling. Of course lack aerodynamic protection at higher speeds and, if you travel with croup, will also miss space for luggage. Nothing that the extensive list of accessories - sold separately - can not handle, but with a high investment. 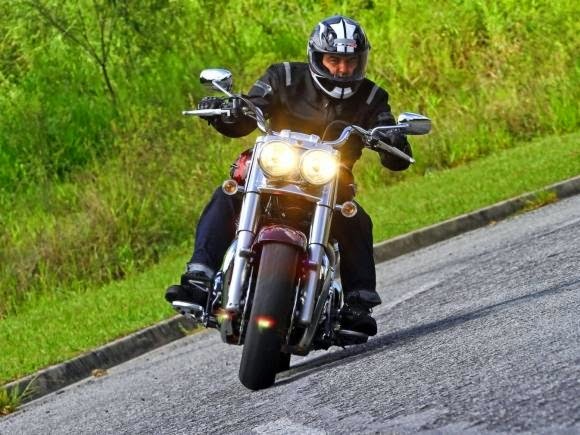 With Thunderbird Commander Triumph expands its varied line-up in Brazil, which already has nakeds, sports, retro models, big-trails and touring. 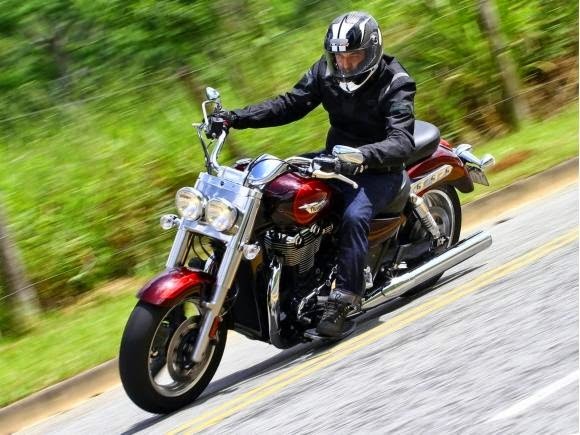 And even more enters the fray for a share of the segment dominated widely by Harley-Davidson. Since the English factory also has the Thunderbird Storm model with visual custom bike. Market factors aside, the Commander and fulfills the proposal of being a cruiser with English touch and has its own qualities. Its price of US $ 16,000, equivalent to a HD Fat Boy, for example, which has more fame, and "soul" according to fans. But if you are not among the harleiros card-carrying, but seeks an imposing cruiser, well finished and comfortable to travel, the Commander should be considered among your options. Tires: 140/75 ZR17 (front); 200/50 ZR17 (rear).